JANET LOWE is the author of the bestselling Warren Buffett Speaks, Jack Welch Speaks, and Bill Gates Speaks (all available from Wiley), as well as Benjamin Graham on Value Investing. Her articles have appeared in such publications as Newsweek, the Christian Science Monitor, the Los Angeles Times, and the San Francisco Chronicle. Ms. Lowe lives in Del Mar, California, with her husband, Austin Lynas. Benjamin Graham and Security Analysis: A Reminiscence. THE BUSINESS AND ETHICS OF FINANCE. Is American Business Worth More Dead Than Alive? The Ethics of American Capitalism. ABOUT STOCKS AND THE STOCK MARKET. The New Speculation in Common Stocks. Stock Market Warning: Danger Ahead! The Future of Common Stocks. ABOUT THE PROFESSION OF INVESTING. Toward a Science of Security Analysis. Testimony Before the Committee on Banking and Currency, United States Senate. Current Problems in Security Analysis. Proposals for an International Commodity-Reserve Currency. Summarization of the Multiple Commodity Reserve Plan. 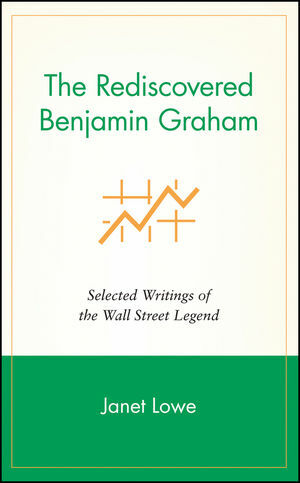 Benjamin Graham: The Grandfather of Investment Value Is Still Concerned. The Simplest Way to Select Bargain Stocks. An Hour with Mr. Graham. View the companion site which features the full transcript of the lectures in the book.